This project builds on past research to control feral cats at the Heirisson Prong reintroduction site at Shark Bay (see pdf below). 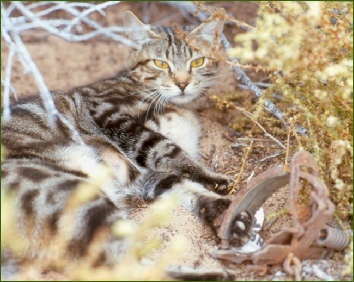 Most control techniques for feral cats rely heavily on periods of food shortage to facilitate uptake of baits. This study looks at the relative dynamics of rabbits (as primary prey for feral cats) and reintroduced native mammal species in response to rainfall to establish whether their dynamics track each other (and lagged rainfall). If the dynamics of these two groups are asynchronous this may require a substantial re-think and re-evaluation of the possibility of reintroduction of native mammals to open systems with feral cats (as opposed to islands or large fenced areas where cats are eliminated before reintroductions take place).